Today’s society moves a hundred miles an hour. Often our day begins with a mad dash, running from appointment to appointment, eating our meals on the fly, and rushing home to deal with family, roommates, dinner, pets, household chores and more; only to collapse into bed feeling exhausted. Whew! I’m tired just typing all that! Exhaustion from living this way day in and day out leaves us feeling worn out, snappy, short-tempered, and even frazzled. If this is you, it might be time to re-evaluate your self-care. There is clearly a direct correlation between the levels in our self-care tank and our level of tolerance in close relationships. A good working relationship requires patience, compassion and nurture on a daily basis. When feeling frazzled because there are a hundred things to do, being receptive in relationships often does not take first place on that list. The doorway to connection and emotional intimacy closes. Eventually the once passionate and thriving connection becomes stale and prickly. Self-care is a profound act which supports the re-opening of pathways to emotional intimacy. Often we rely on our spouses, partners and other close relationships to be our everything rather than being accountable for our own care. Tip: Remind yourself often that happiness is an inside job. Only you can make yourself happy. Self-care is the art of taking care of one’s self, of focusing on our own pleasures for our emotional and physical well-being. Treating yourself with respect and caring takes the pressure off others to make you happy; giving them the opportunity to follow your lead. With all this said, is it time for you to relax in a bubble bath, spend time with friends, have a good gab session? Perhaps tinkering with your car, shooting some hoops, watching the game with some friends fits the bill for you. The choices are infinite so be creative. Setting boundaries is a perfect example of self-care. 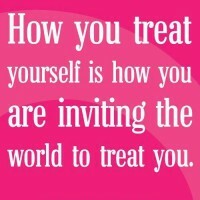 By treating ourselves well, we teach other people how to treat us. Three daily acts of self-care boost your mood and tolerance levels. Need help creating a self care plan? A relationship coaching session can help you create a pathway forward. 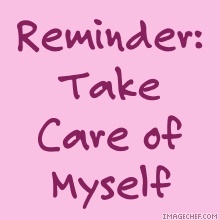 JoyWork suggestion: Begin a Self-Care List. Place 3 daily acts of self-care that you find nourishing. Do them! Let me know how you’re doing on the Accelerated JoyWorks Facebook page or in the comments below. This entry was posted in Self-Care, Uncategorized and tagged Boundaries, Connection, Emotional Intimacy, Happiness, Mood, Relationships, Stress, Well-being. Bookmark the permalink. Great reminder. I needed this reminder. The Lord is always right on time with what we need. Thank you for being His messenger. Blessings.